Our monthly LEGO Club will be on Sunday, May 3 from 1:30-300. Drop in and enjoy free play or try out the optional theme for May: FOOD! For kids ages 3-10. Registration is encouraged. Please don't bring your own LEGO! We have plenty of LEGO for everyone to use. We have Duplos for younger children. The next Petites Chansons is SATURDAY, MAY 2 at 10:30. Welcome, bienvenue, babies, toddlers, preschoolers and your grown-ups! Join Madame Marie as she leads us in French songs and rhymes. You don't need to know French to enjoy this program. Registration optional. If you do register, we can let you know the next date for the program, and also contact you in case of cancellation. Gail Carson Levine on Mon. 4/27! 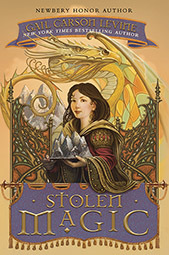 Join us on Monday, April 27 at 7:30 p.m. when Newbery Honor author Gail Carson Levine will talk about her new book, Stolen Magic. Levine won a Newbery Honor for Ella Enchanted and is known for her fantasy books featuring strong girl protagonists. Politics & Prose will be selling copies of Levine's books, but the program is free and no purchase is required. 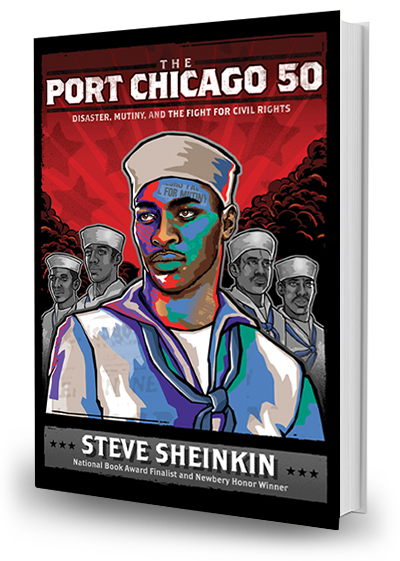 The Children's Book Guild of Washington D.C. will be celebrating Port Chicago 50: Disaster, Mutiny, and the Fight for Civil Rights and its author Steve Sheinkin on Saturday, April 25 at Clyde's Gallery Place Restaurant. This book was one of Karen MacPherson's favorites for 2014! Australian kids' author Andy Griffiths will present his newest comic novel for kids, The 39-Story Treehouse, on Monday, April 20 at 7:30 p.m. Griffiths' books are filled with both zany comedy and many illustrations in the style of Diary of a Wimpy Kid and are popular with kids ages 8-12. Griffiths himself has a reputation as a hilarious presenter, so we expect this event to be particularly fun! Politics & Prose will be selling copies of Griffiths' books, but the program is free and no purchase is required to attend. Join us for Spring Crafts on Sunday, April 19 from 2:00-3:00. Drop in and enjoy flower and butterfly scratch art, decorate a Mother's Day card, or make a felt flower bouquet! All ages are welcome, but crafts vary in their difficulty. Please join us tonight Monday April 13 at 7 p.m. to kick-off a new season of our Caldecott Club, our family book club. We'll be reading together, via the big screen, some of the best new picture books published this year. Then we'll have a brief discussion about each book, and conclude by voting on our favorite of the night. Of course, we'll also be serving lemonade and cookies! This year, the club sessions will be particularly important to me, as I have the honor of serving on the 2016 Caldecott Committee and will be listening closely to the opinions of kids and adults alike about the books we read. No registration is necessary for this fun program. Just come and enjoy reading together some wonderful books! LEGO Club is back! Come to the library on Sunday, April 12 from 1:30-3:00 for LEGO Club for kids up to age 10. The theme is Gardens, for those who would like to explore a theme. Otherwise, enjoy some free play with a variety of LEGO bricks, minifigures, etc. including DUPLO pieces for smaller hands.